Your experience begins at the Aquarium “T” Station on the historic Long Wharf, the focus of Boston Harbor, and the economic engine of Boston for most of its history. From the harbor, we’ll continue past the Rose Kennedy Greenway, State Street and the historic Custom House Tower, the city’s first skyscraper. Then, your guide will lead you toward the famous Faneuil Hall and Quincy Market, which both boast stunning views. Moving into the heart of Downtown Boston, we will stop in front of the Old State House and site of the Boston Massacre. Was it really a massacre or maybe just great propaganda for the Revolution? Ask your expert guide about that one! A short trek through Downtown Crossing and past the Old City Hall will take you to one of the most historic places in the country, King’s Chapel Burial Ground (city’s oldest burial ground) and King’s Chapel (the first Anglican church in the country). Whenever possible, your guide will take you inside King’s Chapel, the first church in the USA to have a pipe organ. If we’re lucky, we might just get to hear it being played. Somewhere along the way during this tour, you’ll have a chance to rest your legs and enjoy a refreshing local beer. Your guide will choose among some of the most historic, quirky and hidden local bars and taverns in the area. On most weekdays, you’ll have a chance to see the government at work (or not) inside the inspiring, historic, and beautiful Massachusetts State House, designed and built by famous federalist architect Charles Bulfinch in 1798. Outside the State House, take in the views of modern Boston, including the skyscrapers of Downtown, the Financial District, and the tallest building in New England - the John Hancock Tower. We continue our journey through Beacon Hill, where you’ll have a chance to take in the quintessential architecture of Boston’s red brick row houses. Get out your cameras – this neighborhood is one of the most photogenic in the city. Finally, we arrive at the beautiful Boston Public Garden, one of Boston’s favorite green spaces, where you’ll see locals walking the dogs, playing with the kids, and enjoying lunch in the shade. 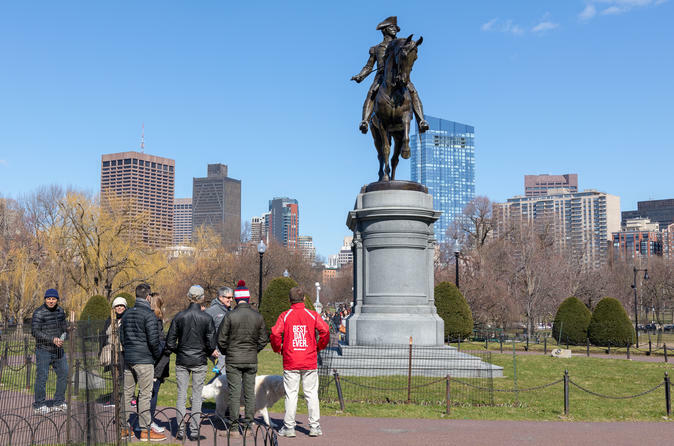 Your guide will point you in the right direction, and will help with any and all recommendations for great things to do in Boston that evening and beyond.